After gastric bypass surgery, you need to wait until your body has healed before you can begin eating lettuce and other green leafy vegetables again. Because the surgery restricts the size of your stomach and rearranges your digestive system, you must follow dietary guidelines concerning portion size, fat and protein when planning your meals. Follow your surgeon's instructions exactly to avoid digestive upsets and maintain your health. Gastric bypass surgery, a type of bariatric or weight loss procedure, helps morbidly obese patients lose weight by removing most of the stomach and rearranging the small intestines to block calorie absorption. Patients lose about 50 to 60 percent of their excess weight within the first 24 months, according to MayoClinic.com. However, they must make long-term changes to their diets and lifestyles to avoid regaining the weight. After gastric bypass surgery, patients drink clear liquids for the first 24 to 48 hours, then progress to sugar-free, caffeine-free full liquids for the next 10 to 14 days, according to Linda Aills, R.D., lead researcher in a study published in the September 2008 issue of "Surgery for Obesity and Related Diseases." Patients then consume pureed or blended foods for 10 to 14 days, followed by soft foods for 14 days before progressing to solid foods. After about 8 weeks, you may begin to add small amounts of solid foods to your meal plan, but your new digestive system may not be ready for raw vegetables for another month or so. At first, add small bits of lettuce and chew it well to avoid gas or other digestive symptoms from the fiber content, which is high in raw vegetables. Your long-term eating plan should include about 1.5 to 2.5 cups per day of lettuce and other raw vegetables. Although lettuce contains few calories, adding high-fat salad dressings, croutons, bacon bits and other toppings can raise the calorie level well above what you need for the day. Focus on toppings such as hard-boiled eggs, grilled chicken, salmon, tuna or lean beef that add much-needed protein and pile on any raw non-starchy vegetables that you can tolerate to keep you full longer. 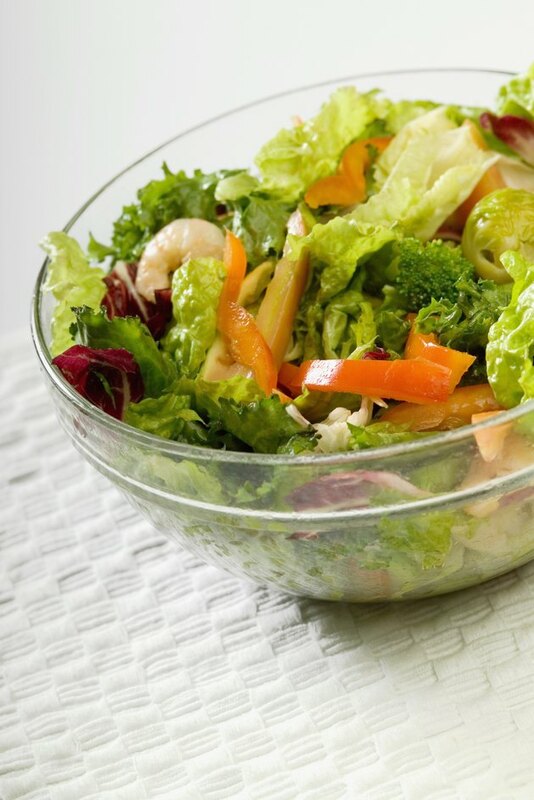 Choose low-fat dressings and dip your forkful of lettuce into the dressing instead of drenching the salad. How Many Calories per Meal Should a Gastric Bypass Patient Eat?